Tourists often assume there’s only one kind of Holy Trip – but in fact there are two very different ways to see Israel. Christians take the Jerusalem and Galilee routes that follow the travels of Jesus. On the other hand, Jews take a Hebrew Heritage tour that doesn’t touch the Christian sights, and gives a completely different picture. For example, in Tel Aviv, you sit in the chairs at Independence Hall just as they were in 1948 when David Ben-Gurion proclaimed the rebirth of the ancient nation of Israel. The Museum of the Diaspora in the Tel Aviv University allows people to trace their Jewish heritage back for generations. Either tour is great, and together both give you the complete picture of Israel. During the month of June, Israelis celebrated the 50th Anniversary of the Six-Day War and considered the highly important steps forward that Israel took during the conflict. One of the most important events during that war was the battle of Ammunition Hill. A year ago, I climbed the hill and walked through the trenches that marked the turning point in the war. The decision to take the Old City was made immediately after this conflict. Members of Battalion 66 of the 55th Paratroopers Brigade fought on Ammunition Hill in one of the bloodiest and most brutal campaigns of this war. In June, the surviving soldiers returned for a reunion at the sight. The members of the battalion had expected to make their jump in the Sinai Peninsula, but at the last minute were diverted. They soon discovered more resistance from the Jordanians than anyone expected. Beginning at 2:30 in the night in complete darkness, the exploits of brave men unfolded quickly. One Israeli paratrooper threw himself on top of a grenade to save the men around him. When senior officers fell, junior officers picked up the baton and charged forward. These were ordinary men who did extraordinary thing for their brothers and country. As the battle progressed, Israeli Intelligence proved to be completely inaccurate and there were two to three times more Jordanian soldiers than anyone expected. The Israelis pressed forward in the midst of terrible odds and endured. On the morning after, a jeep appeared with Moshe Dayan and Ezer Weizman, chief of Military Operations, in the back seat. Telling Doron Mor, the battalion deputy commander, to lead or fight up the hill to Mount Scopus, the Jeep plowed up to the National Library and the leaders assembled on the roof. As they looked down on Jerusalem, the decision was made to enter the Old City. Since the days of King David Since no one had ever conquered Jerusalem from the Lion’s Gate in the east. “This will be the last time!” Moshe Dayan said. The next day Israeli troops entered through the Lions Gate and after 2,000 years the Jews had taken their city back. 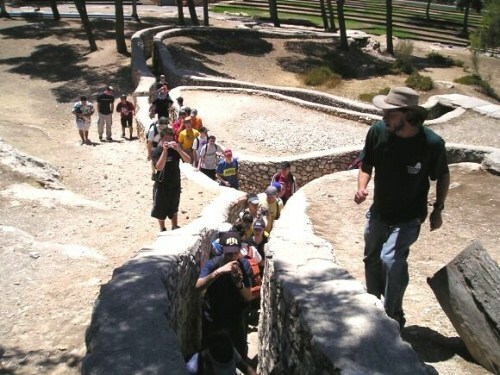 Should you take a tour of Israel, regardless of whether it is a Hebrew Heritage tour or a Christian excursion, be sure and tell your guide you want to walk through Ammunition Hill. It’s a sight you won’t forget.